Hello, my name is Rachel and welcome to the Health Base. 🙂 Along with supplying thorough guides and reviews of the best products, myself and the team at the Health Base also like to provide important informational articles. We choose the content for these articles in two ways - as we do our research and testing for our guides and product reviews, we take the time to compile lists of the key issues and questions that people have expressed regarding the relevant topic. This is the first way. The second way is that we listen to the Health Base community. You guys are are always sending us questions and ideas for new content. Such feedback is a great resource for us as it shows us what topics we should be focusing our time and energy on. So, on behalf of the Health Base team, thank you very much and keep up the good work! Can A Good Quality Serum Be Made From Home? 4 – Does My Serum Actually Work?! As stated, this article will be solely devoted to Homemade DIY Serums. However, for a more complete breakdown and in-depth look into Vitamin C and it's name related Serums then please check out my comprehensive guide on this topic. In a short while I’ll be going through three methods of making a homemade option that have been proven to work. Before I get to this though, I'd first like to answer two questions: is it actually possible to make a high level Serum from home? And what are the benefits of such an undertaking? The simple answer is yes! Though, it must be noted that it’s not necessarily an easy thing to do. I will address the possible problems that may occur in the formulaic process later on in this article. The first thing to say is that it’s very easy to see why people are interested in making their own Serums. Vit C and the Serums that share the same name are so massively beneficial for our skin and our overall health. The benefits really are endless. From boosting collagen production; to reducing skin hyperpigmentation; to increasing protection from the sun; as well as providing an abundance of antioxidant capabilities for your skin to absorb. These are just some of the reasons and benefits as to why this orange mineral is such a treasured supplement. Therefore, the quick answer is that yes you can make a Serum, and yes, you should definitely be using Vitamin C. So with that said, how do we actually go about achieving these things? Step 1 – place all the Vit C powder and filtered/purified water into the small bowl. Whisk the contents until they are completely infused. Step 2 – next, add all the aloe vera gel into the mixture and stir with the whisk once more. Step 3 – add in all the vitamin E oil as well as your chosen essential oil into the bowl. Ensure that all the contents are thoroughly whisked. 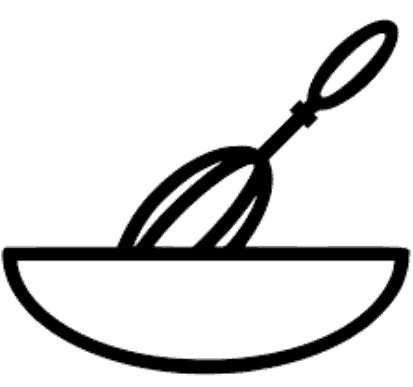 Step 4 – Use the funnel to transfer the contents of the bowl into your opaque container. Do this in a prompt manner so as to avoid your Serum becoming exposed to excessive light or air. Step 5 – Place your newly made mixture into the fridge and only remove when you are going to apply it to your skin. TOP TIP: The majority of DIY Vitamin C Serums are very sensitive to sunlight, even more so than the ones sold in chemists and shops. Therefore, to prolong the integrity of your mixture, I advise that you keep it stored in your fridge and only use it at night when the sun has gone in for the day. Step 1: in the small bowl, whisk all the filtered/purified water and Vit C powder together until the latter is fully dissolved. Step 2: next,​ add in the aloe juice and vitamin E oil in their entirety. Also ensure that these are thoroughly whisked into the mixture. Step 3: With the use of a funnel, transfer the mixture into an opaque container. Make sure that the container is also airtight. Step 4: Store the newly made mixture in the fridge for two weeks without removing it from the fridge. This, in theory, should allow your Serum to reach the desired pH level. TOP TIP: it’s always a good idea to give your final product a gentle shake before beginning the application process. This is because the Serum will be quite thick, so a quick shake will loosen it up and ensure that it can be applied in a smooth fashion. Step 1: blend all the distilled water and the Vit C powder in the bowl by way of whisking. Step 2: add in 15ml of the glycerin and stir once again. Step 3: add in the remainder of the glycerin and stir thoroughly until the mixture is complete. Step 4: transfer the mixture from the bowl to the opaque container by using the funnel. Step 5: immediately store the newly created mixture in a fridge. TOP TIP: the glycerin is a really advantageous addition as it will naturally act as a moisturizing agent to soothe and refresh your skin. The glycerin will also extend the life of your Serum – something that is really helpful when taking into account the decaying nature of Vit C.
Be careful to not get any of this serum in your mouth as glycerin can be potentially damaging to your teeth. IMPORTANT NOTE: it's essential to point out that the three above methods are quite basic and limited in terms of prep and ingredients. The reason for this is that making the best Vitamin C Serums takes considerable effort in regards to the formulation. The big brands spend lots of money on this formulation process, ensuring that they use the best of the best when it comes to machinery and ingredients. We know that most people do not have these types of resources so, therefore, we chose to keep the homemade recipes that we've outlined above as simple as possible. While this means that it's still possible to create a good product, the homemade version can't really compete with the best Vit C Serums available on the market today. - Purchase a top of the range Vitamin C Serum or conceive your own at home. Ensure that that the concentration level of the key mineral is suitable in relation to your skin. Too high a percentage will leave your skin raw and irritated, while too little will result in inferior results. ​- I myself use a 20% concentration percentage – such as can be found in the Kleem Organics product. However, if you have dry or sensitive skin then the Obagi Systems version might be the better call. - To begin with, you must ensure that your face is clean and washed before you apply your choice of Serum. In order to do this properly it is important to have a good exfoliation process in place. In my experience, the best method of cleansing your face is to use a clean hand towel; some warm water (no soap); and a mild cleansing agent. - You can gently pat your face to take off some of the water, but do take care to leave your skin damp as this will allow better penetration for the formula. - The next step is to apply the Vit C Serum that you have chosen. In order to do this effectively, first place a small amount of the Serum onto your fingertips. The Serums come in small bottles, usually between 1-4oz., so take care not to waste any by over-using it. - Next, gently massage the cream into the skin of your face in a smooth manner. There is no need to be vigorous in this application, simply allow the Serum to do its job. Once you’ve achieved this, give the cream 5 minutes or so to dry. - Once the cream has dried into your skin, it is then a good idea to apply a top moisturizer. This will further help to lock the Serum into your skin by creating a protective barrier. - The moisturizer will also work to soothe and refresh your skin. - You can then repeat this process on a daily basis. I repeat this process in the mornings and evenings, the whole routine takes less than 15 minutes. However, in saying this, using a Serum only once a day may be enough for you. - Perhaps even using this treatment once every two days will suffice. How often really comes down to personal preference – everyone’s skin is different, after all. If you think that you have sensitive or dry skin, then it’s probably best that you only use this treatment just the once per day. Using it any more than this can cause irritation. If you are unsure about you skin type, it is always advisable to first go and see your doctor or local dermatologist before you begin any new treatment. Stop if the Serum is causing irritation!! This one may seem a bit obvious, but it’s still worth mentioning! A lot of people continue with medical or beauty treatments that are causing harm to skin – mistakenly believing that their skin is just getting used to the new agent. While this may be the case, why take the risk? Rather than persisting with the irritant, it’s a far better idea to go see your doctor and get a professional opinion. It could very well be the case that your skin is allergic to whatever’s in the formula. As I’ve proven, it is indeed possible to create a good quality cream. However, I have to also add that it's simply not possible to match the best products that are available on the market today. This is just the reality of the situation. Why? Simply put, because most people do not have the medical and pharmaceutical knowledge, technical skills, or equipment that the top brands utilize when they are constructing their Serums. 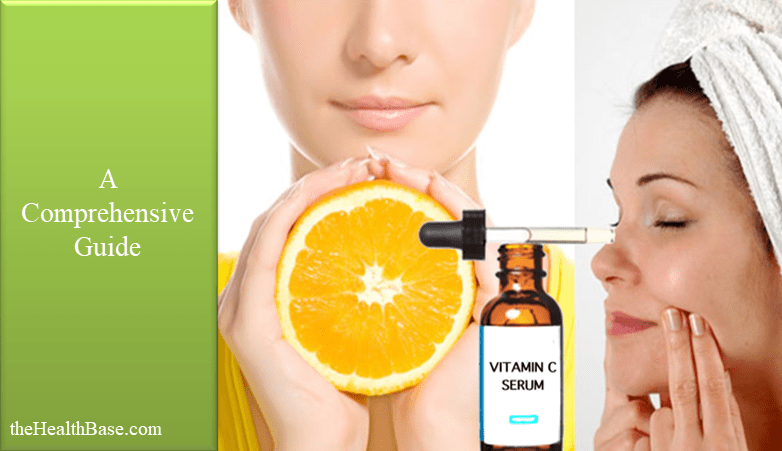 Vitamin C, due to its makeup, is quite a difficult element to formulate. It’s a mineral that can become damaged or can start to degrade quite easily. As such, constructing a cream of your own can be a complicated process. Due to the fact that L-ascorbic acid is acidic in nature (thus the name), this means that it best penetrates your skin on an acidic pH level. The problem lies in the fact that you need to get the pH level spot on or else the Serum will not have the desired effect. A Serum with a pH level that is too low will result in your skin becoming irritated and drying out. Human skin has a natural pH of in and around 5.5 to 6.5. In a perfect world, you’ll want to possess a cream that has a pH level of between 2.5 to 3.5. This level is low enough so as to ensure that everything works correctly, but not low enough to cause any negative issues with your skin. 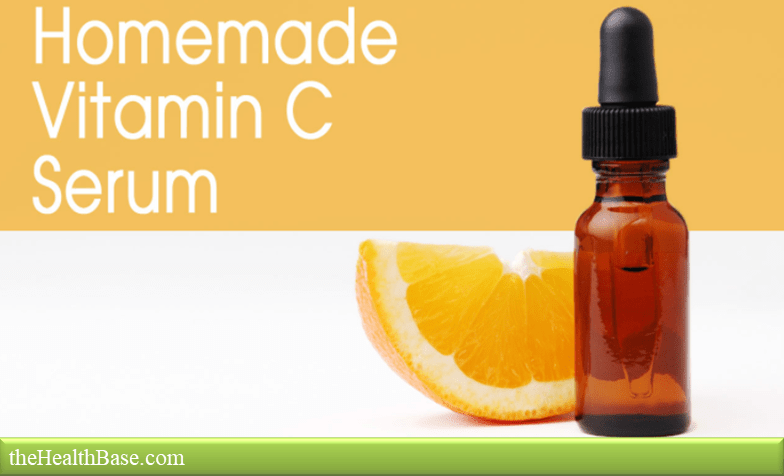 Low pH levels are a key mistake that many DIY Vitamin C Serums possess. If you have read our guide on Vit C Serums, then you will know just how important storage is when it comes to prolonging the life of this product. Why? Because, as mentioned before, this orange slice of nature is very susceptible to degradation. Excessive sunlight or air will cause excessive oxidation to occur within the formula. This will ultimately result in it becoming ineffective over a period of time. Degradation can easily be spotted in the form of brown and yellow taints/spots will appear in the normally white texture. This storage worry is why the best products are sold in opaque, airtight containers immediately after creation. The problem that people like myself and you will encounter at this point is that we will not possess the machinery to create such containers. So, what we can do to counter this issue? Unfortunately, there is not a whole lot that can be done. The only real steps that can be taken is to pour your mixture immediately into an opaque, airtight container and then place this container into your fridge until you want to use it. Even with this, a homemade Vitamin C Serum will still degrade and break down quicker than one that’s been formulated and packaged within a proper laboratory. A problem that occurs with many DIY versions is that the ingredients are either lacking in variety or volume. As described in our Serum Guide, the formulaic process of making is key. This process is where the effectiveness and quality of the resulting cream will be established. In order to assure this, the ingredients that are incorporated into the Serum’s design have to be spot on. They first of all have to be of the correct type, and they also have to be of the correct volume. If either area is left lacking then the end result will mirror this inferiority. As you can imagine, trying to figure out which ingredients are best; which volumes are best; and where to actually get these ingredients from, can be quite taxing in terms of time, effort, and cost. In saying this, it is possible to source and then use the correct ingredients - it just takes a bit of perseverance and experimentation! As you have may have noted from our three recipes, the ingredients are sparse and very basic. This is simply because the more ingredients that you add in to the process then the more likelihood that something will go wrong. Of course, this lack of additional ingredients will damage the resulting cream in terms of its effectiveness and its longevity. This is probably the most worrisome and maddening aspect of creating a homemade Serum! Even if you believe that you have taken all the correct steps, there’s really no way of categorically proving that it is of any use! A very annoying thought, I know. Your Serum may look the correct color; it may be stored safely; it may contain all the correct ingredients in the correct volume; but it also may have a tremendous flaw that you hadn’t considered! There’s really no way of knowing. Just because a cream isn’t aggravating your skin, this doesn’t mean that it’s being effective. When you buy one of the top products on the market today, you are also buying peace of mind. You know that the Serum you’ve bought has been scientifically constructed and proven to work to its maximum effect. With a DIY Serum, no such peace of mind can be obtained. 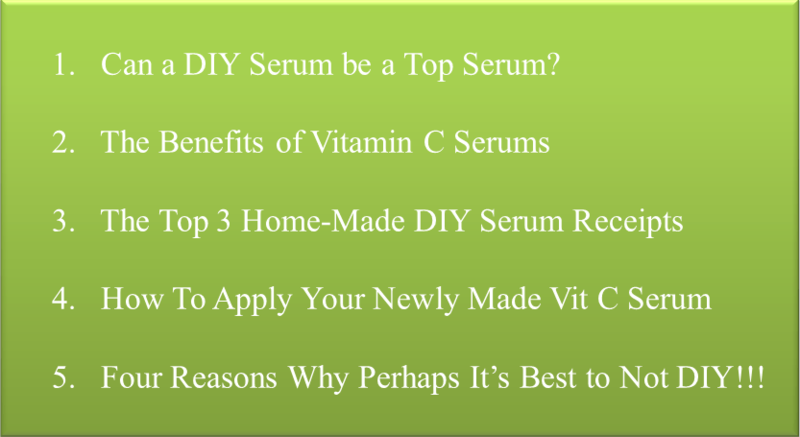 There are contrasting views when it comes to DIY Vit C Serums. Many people think that they are a wonderful idea, others think that they are an unbelievable waste of time. Personally, I lie somewhere in the middle of these two extremes. There’s no question that these Serums are brilliant for your health. And that creating your own version will certainly save you money in the long run. However, the effort required, and difficulty of, creating a top Serum at home is something that really has to be questioned. I’ve tried to make a homemade Serum. Honestly, I didn’t have too much success. It definitely can be done, but it's quite a difficult process and I usually end up with a rather basic one. Therefore, my verdict on DIY Vitamin C Serums is to treat it as bit of fun. Mess around with it, experiment, try different things, but don’t hang your hopes on creating a great Serum! If you don’t think this is path is the one for you, or if you want to know more on the subject of Serums, please check out our guide on this matter. In this guide we have conducted a fully comprehensive overview of this particular niche. 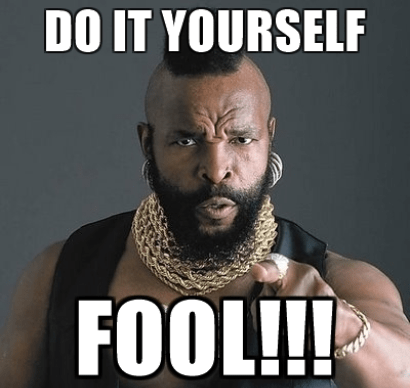 However, if you’re feeling brave and industrious then why not follow the eternal, albeit altered, words of Mr. T…. P.S. If you liked what you have read and want to further expand your knowledge on the area of Vitamin C Serums, then why not check out our related posts below. We will be adding new posts periodically. Also make sure to check out our entire knowledge base - https://thehealthbase.com/. Obagi Systems Review – Best Vitamin C Serum?